My blog has been taken over as of late by birds. Here's something completely different. 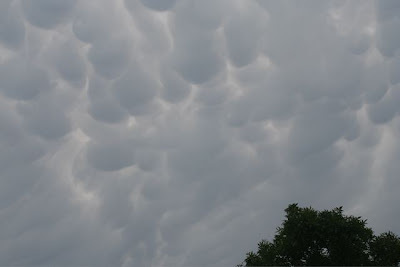 Last night a big storm blew through and as the front approached there was the great little band of mammatus clouds. I didn't have a wide enough lens on my camera to capture a really spectacular photo but you get the idea. The weather turned nasty after these clouds pushed on.